Posted: 4/29/09, 2:23 pm EST. Launching Passport To Fine Jewelry on HSN during March’s International Women’s Month Event was such a privilege & fun experience. I am so excited to be part of the HSN family. And, I’m thrilled to start talking to you here in my new blog. So let me know what you’re thinking, ask questions and share your thoughts on all things gold jewelry. Did you know that in all of history, only 161,000 tons of gold have been mined, barely enough to fill two Olympic pools? I must admit, I’m as passionate about gold today as I was in my teens working along side my father in his leased jewelry space in the NY Korvette’s stores. After almost 3 decades, I can still remember the women that would buy themselves gold pieces of jewelry and the emotions they expressed were so powerful, I was hooked! I remember seeing these women as confident, sophisticated and beautiful, that is when I knew I wanted gold to be a part of my life, forever. Even after a decade of presenting 14Kt gold jewelry on television, I continue to be as passionate about gold jewelry today as I was when I started. Although the economy is really tough right now, I have to tell you, I am staying true to my love of gold! Now more than ever, l treasure the “value” that my gold jewelry has. How many of us can say we can make a purchase today that will outlast our lifetime? Gold jewelry continues to be the undisputed ruler in all jewelry segments. The love of gold will never change, what’s different today is what people buy and how. 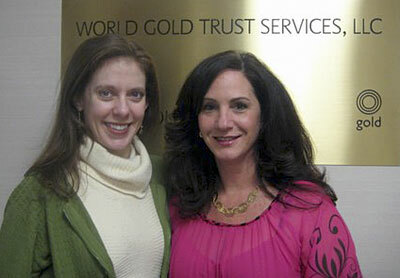 Did you know that more than 50% of women are buying fine gold jewelry for themselves? Gold jewelry still remains a way to express individuality and personal style, wearing gold jewelry says you are sophisticated and successful. Gold makes a strong first strong and lasting impression. Gold is usually a gift of reward or achievement, that is why so many graduates receive the gift of gold. Gold is an expression of love, so Mothers Day is a perfect time of year to give the gift of gold. Gold is a wonderful commemorate of religious occasions such as weddings, communions or birth. I am a true gold lover. Please share with me some of your “unforgettable” gold moments. What was your first piece of gold jewelry? Is there a gold gift that means something special to you? Make today one of the 365/24/7 a week you can wear gold. Thank you so much for your well wishes, it means so much to me. Happy Mothers Day To You Too. Please let me know if there are any gold pieces that you would like me to look out for during my next visit to Italy, I would love your suggestions. I look forward to hearing from you again. That you for joining me from the other network. Many people are wondering “why the switch”? As you know my Treasures D’ Italia & Passport To Fine Jewelry collections are both very fashion forward and medium to high end jewelry pieces. I want to stay true to my brand and to my customers and moving up to HSN will allow me to continue to bring them the finest gold fashions without making any compromises. I am so happy to be part of a group that loves gold… I will focus on finding you a gorgeous pair or filigree hoop earrings, did you see the filigree heart pendant that was on May 13th HSN# 405-928, that is truly a beautiful piece. I will work with that manufacture to create a pair of hoops in Filigree. Thanks for your suggestion, please keep them coming. You and I are one of many women that will not comprise on quality or style and 14Kt gold offers both. There is very little that can substitute for 14Kt gold and gemstones. As you know, Jan is a very dear friend of mine and after checking with Jan, she would love to hear from you (please send me your e-mail address and I will forward it to her). 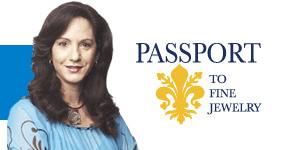 Please continue to tune in every Wednesday in the month of May for Passport To Fine Jewelry! It is so nice to hear from you and I am so happy to hear that you enjoy many of my Passport To Fine Jewelry gold pieces. Yes, we are currently in the works of adding slip on bangles to our collections. We are hoping to bring them in either at the end of May or in our July Shows. If you enjoy stackable rings, please go to the Passport website on HSN, we just added a few more that you will be able to view on May 20th. Please keep your comments coming. A case for lace: In these economic times, designers are seeking to develop the most creative and quality driven collections they can while keeping their eye on a more accessible price point. Lacy looks offer a perfect alternative. Advances in laser technology allow the creation of beautiful and more intricate motifs and patterns. Enamel is also taking its place in the design of many high end designers. Like the trend towards mixing precious materials with non precious material such as leather and cord. Charms continuing their personal appeal!